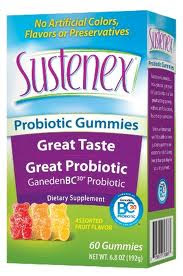 I recently got the chance to try out Sustenex Probiotic Gummies and Probiotic Chews. These dietary supplements contain probiotics which help maintain a healthy digestive system that can lead to a healthier body. What are probiotics? As defined by the World Health Organization (WHO), probiotics are live microorganisms, which, when administered in adequate amounts, confer a health benefit on the host. 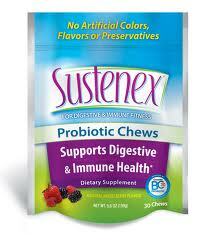 Sustenex® contains the probiotic, BC30. My daughters and I decided to see what Sustenex Probiotic Gummies taste like. We were all amazed at how much the gummies looked and smelled like traditional gummy bears. Guess what? They taste exactly that way! We all had to stop ourselves since the daily recommended amount you can have is 1-4 of them. 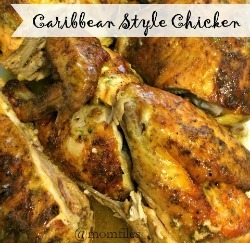 They contain no artificial colors, flavors or preservatives and have only 24 calories for every 2 pieces. We tested out the Probiotic Chews the following day and were a bit leery. Lucky for us they tasted like a cross between a Starburst fruit chew and a Laffy Taffy! Each chew contains 1 billion cells of the probiotic, BC30 and has only 20 calories. The great part is there is no worries about refrigerating your probiotic supplement like you would with yogurt and you don't need to swallow enormous pills. You can keep some in your purse, desk or take them along when you travel. Sustenex probiotics are great for the whole family and are a delicious and convenient way that can help support your digestive and immune health. You can purchase Sustenex products at a variety of retail stores including Target, Walmart and Amazon.com. You can find a complete list of retailers here. How would you like to win a back-to-school immunity kit? 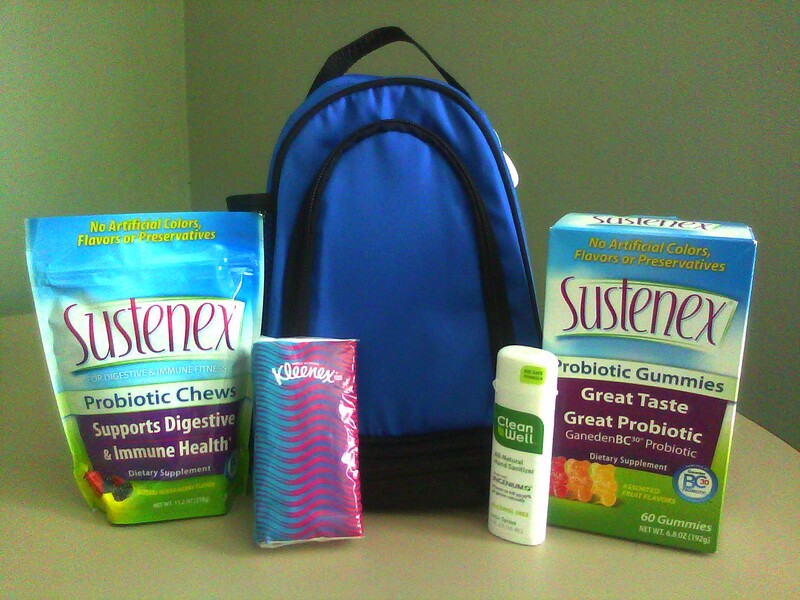 The kit comes with a lunch tote, 1 box of Sustenex Probiotic Gummies, 1 bag of Sustenex Probiotic Chews, 1 travel sized Kleenex facial tissues and 1 Clean Well all-natural (alcohol free) spray on hand sanitizer. One lucky Momfiles reader will win this great gift pack simply by leaving a comment to this post letting me know why you want to win this prize. 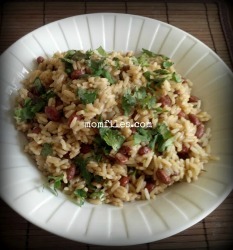 This giveaway is open to US Residents only and will end at 9:00 PM EST on July 15,2011. Please be sure to leave your email address in your comment if you do not have a Blogger Profile. One winner will be chosen at random and contacted via email to claim prize. Good luck! I received products samples to review and all opinions are 100% mine always. This is a great kit to keep my child healthy. Are they for preschoolers as well? Or older adolescents, like your girls? I dread the thought of back to school time. It seems like we catch everything that goes around. I would love to have this. I would love to win this because every year my daughter ends up getting sick because her immune system/defenses are down. With this, her body would be in better shape to fight the nasty germs while keeping her body in healthier shape too. Protecting my son from illness is important to me because of his asthma. Probiotics can help do this. I'm all about keeping healthy! This kit would be great. My oldest daughter has Asthma and back to school is always a scary time at our house. The first week of Kindergarten she caught a bug that caused her to have Pneumonia and led to a severe Asthma attack. She spent 5 days in PICU and another 2 days at the hospital recovering. I would love to try this to help boost her immune system and hopefully avoid another incident like that from happening again. I like you both on Facebook user Lisa Garner. I'm following you both on Twitter @lisalmg. With three children, any school supplies or vitamins are a great help. Following sustenex on twitter as nikkidavis05. Being a single mother of 3 kids and being on a tight budget anything helps. One less thing I would have to get for my kids to keep them healthy in the school environment. Thanks for the chance! 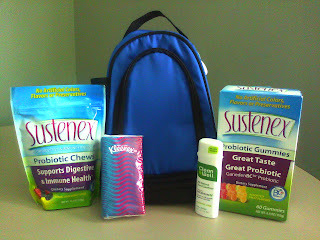 Thanks for the giveaway...we want to promote / support digestive and immune health in our kids ! I'd like to win for better digestive health.